The ISG related sensors or system error occurs. The yellow AUTO STOP ( ) indicator on the instrument cluster will stay on after blinking for 5 seconds. The light on the ISG OFF button will illuminate. 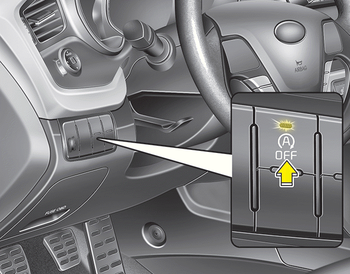 If the ISG OFF button light is not turned off by pressing the ISGOFFbutton again or if the ISG system continuously does not work correctly, we recommend that you contact an authorized Kia dealer as soon as possible. When the ISG OFF button light comes on, it may stop illuminating after driving your vehicle at approximately 80 km/h for a maximum of two hours and setting the fan speed control knob below the 2nd position. If the ISG OFF button light continues to be illuminated in spite of the procedure, we recommend that you contact an authorized Kia dealer as soon as possible. Before leaving the car or doing anything in the engine room area, stop the engine by turning the ignition switch to the LOCK/OFF position or removing the ignition key.